Transport Minister Khaw Boon Wan, 66, said recently that he fractured his left arm when he hastily got out of bed to go to the toilet. The resulting fall led to a three-hour operation and a two-week stay at Singapore General Hospital. Globally, about one in three older adults experiences a fall each year. Falls may seem trivial but they are the main cause of injury in people aged 65 years or older and can have devastating consequences. Associate Professor Reshma Merchant, head of geriatric medicine at National University Hospital, said that the data here - from a 2017 study on 1,051 Bukit Panjang residents aged 65 and above - showed that the prevalence of falls was 10.1 per cent among robust older adults, 15.4 per cent among pre-frail adults and 14 per cent among frail adults. Frailty is diagnosed when three or more of these five criteria are met: unintentional weight loss of 5kg or 5 per cent or more of one's weight in the past year; self-reported fatigue; difficulty in walking up 10 steps; difficulty covering several hundred metres; as well as having illnesses. The presence of one or two of these criteria would identify a person as pre-frail. The prevalence of falls among those who are frail and have underlying memory impairment is higher at 28.6 per cent, Prof Reshma said. However, Asians tend to under-report falls, she added. Nevertheless, falls put older adults at risk of head injuries and hip fractures. Fractures, like the one Mr Khaw suffered from, occur in 3 to 5 per cent of the falls among older adults, said Prof Reshma. The fear is that they suffer a hip fracture when they fall and land on their hips. 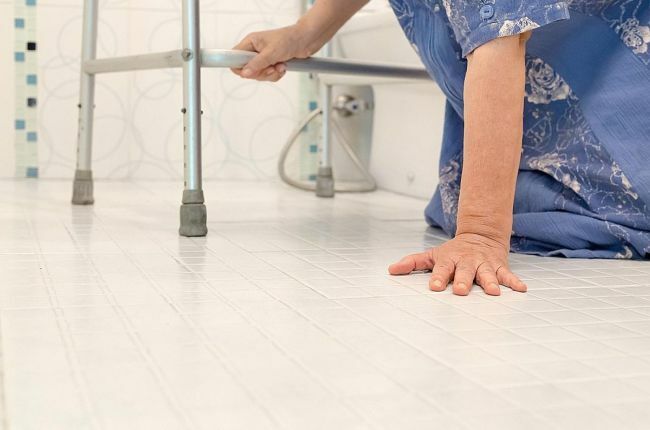 Many patients do not recover fully from a broken hip and end up being admitted to a nursing home or having to depend on a walker or wheelchair. Up to 20 per cent of hip fracture patients die within a year. "If they are not mobile, they can't walk and their muscles get wasted. They can get complications, such as bed sores, pneumonia, deep vein thrombosis, urinary tract infection, constipation, which can kill them," said Dr Tan Sok Chuen, an orthopaedic specialist at Mount Elizabeth Hospital. About 2,500 hip fracture cases occur here every year and this figure is projected to increase to 9,000 in 2050, due to Singapore's ageing population. Dr Tan said that hip fracture patients tend to be in their 70s or 80s. "More than half of the lower limb injuries in the elderly which we see are from hip fractures," she said. "Hip fractures can be caused by minor falls due to osteoporosis in elderly patients." A large proportion of hip fracture patients are older women because they experience accelerated bone loss when they reach menopause and their level of oestrogen, a female hormone that protects bones, drops, said Dr Tan. "Singaporean women tend to be lighter in body weight, putting them at even higher risk of osteoporosis." Falls in the elderly can also be caused by the physiological changes associated with ageing, such as changes in posture and gait. For example, when one cannot lift one's feet high, said Prof Reshma. A degenerative joint disease like osteoarthritis, or sarcopenia, which is muscle loss associated with ageing, can also predispose a person to falls, she added. From the cases she has seen, one-third of the falls in older adults were caused by their environment as well as inappropriate footwear. Other reasons include vision impairment, dementia leading to poor safety awareness and acute illness. Dr Tan said elderly patients should seek treatment for their eye problems, if any, and get screened and treated for osteoporosis. Having a previous fall is a key risk factor for recurrent falls. And falls can lead to a fear of falling, causing those who have suffered a fall to restrict their mobility on their own accord. This can lead to further functional decline, which results in a higher risk of falls, not to mention social isolation and depression. Prof Reshma said a fall may not always be preventable, so aim instead to prevent injuries such as fractures, by ensuring that your bones and muscles are healthy. An older adult would usually need to consume 1,000 to 1,200mg of calcium a day. Also, regular exercises that target balance and muscle strength have been found to help prevent falls in older adults. Studies have shown that taiji, an ancient Chinese practice, is effective in doing so. Many elderly people fall in their homes and even minor falls can lead to serious injuries.